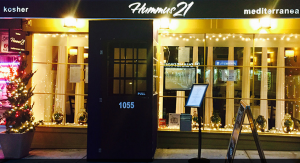 We’ve received a lot of questions about the new “kosher” Midtown East restaurant, Hummus 21, which despite its name, is a nice sit down meat restaurant with waiter service, but unfortunately does not have a mashgiach temidi and is open on Shabbat. In a long conversation with the owner, they fully acknowledge that there is no kosher supervision over Shabbat, nor consistently throughout the week. Having said that, all the meals they serve on Shabbat are prepaid for those non-Orthodox Jews in the area who want to dine out on Shabbat in the neighborhood. Hummus 21 claims to only procure Glatt Kosher meat that is certified by the OU. The restaurant is under the kosher supervision of the IKC (Rabbi Zev Schwarcz of Brooklyn), but is not recommended for anyone who eats Glatt Kosher, due to their lack of supervision.